This is a cut up version of our 101 small business mastermind podcast #89. It will teach you very valuable things about what makes a successful business card and how to pass them out. Plus tells you about how you are to react when you get a business card. When you are networking it’s really important to have marketing materials that really work. One of those is your business card. Business cards have to have a talking point and follows along the line of making good flyers. 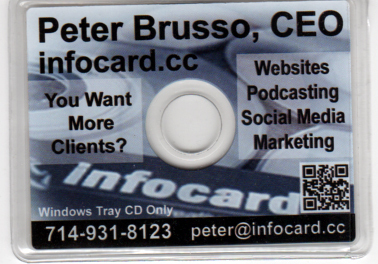 As you will see with my business card it’s a CD ROM that really works! It carries video and clickable sections that explore all the aspects of my company. When I hand them out, which is last as I wait for everyone else, when I do everyone starts talking about my business card. Do you think they remember me? Oh Yes… and I even say if you don’t like it after you watch the CD ROM material then it makes a handy-dandy drink coaster! Potential clients never throw it away and it usually stays close to their computer. This is priceless!!! So watch this video and learn what you can do to get your business card noticed and you remembered. That is the entire reason for business cards in the first place but hey, you will learn that plus more in this video. I also want to encourage you to go look at our 101 small business mastermind website that is jam packed with great ideas to help you improve your business.